The image that is acquired through the lens of a telescope becomes visible through an eyepiece. Each eyepiece provides a given magnification This is determined by the ratio between the focal length of the objective and eyepiece. Sounds complicated, but it is not. 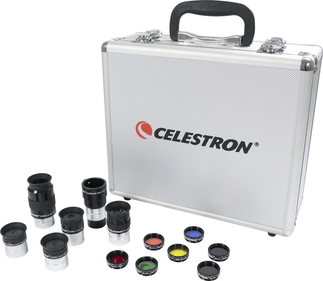 In our shop you can find eyepieces in all shapes and sizes and for all types of telescopes. 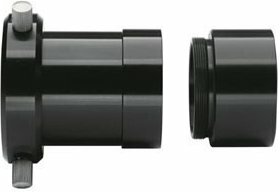 Change the eyepiece fitting of your telescope to 2"
A Plössl and Supper Plössl consists of four or five lenses. A Super Plössl has a bigger field of view (in degrees) than a Plössl. 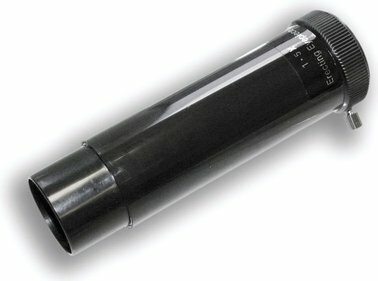 This eyepiece is ideal for a variety of observing possibilities such as deep sky observing and planetary observations. The biggest disadvantage of this eyepiece is its short eye distance which may cause problems for people wearing glasses. A Kellner or an achromatic eyepiece consists of three lenses and has a 45 degree –field of view displayed with minor chromatic aberration (dispersion). However, they are pleasant to use and work best in telescopes with a long focal length. 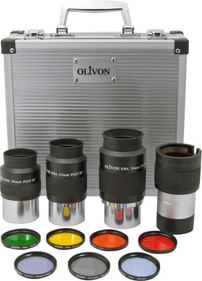 These eyepieces are good value for money and cost between 15 and 45 euros. The Super Wide Angle (SWA) has an innovative element design and yields very sharp images of the observed objects. Contrast is high and hardly any chromatic aberration occurs. This eyepiece has a large field of view and it really is the pinnacle of technology. The Ultra Wide Angle (UWA) has an extremely high resolution, high contrast and sharpness across the entire field of view. The best materials have been selected for this very special eyepiece. The design consists of multiple layers excluding glass which create the highest level of optical performance. A centering eyepiece is very suitable for astrophotography. Two versions are available: a centering eyepiece with a cord and a cordless centering eyepiece. Telescopes and eyepiece reverse the image. An erecting eyepiece is used to get an upright image, making terrestrial observations possible (such as bird viewing). Over the last couple of years, one of the biggest breakthroughs in the field of amateur astronomy has been the introduction of the electronic eyepiece. This device allows you to store images on your laptop or computer. These images can be edited, magnified and saved. This way, you have beautiful observations on your computer at the push of a button. Do you want to take photographs of space objects? Then we advise you to install a camera on the telescope. This is referred to with the term ‘piggy-back’. An illuminated crosshair eyepiece enables you to correct any tracking errors. As a result, you will get better photographs. There are enough eyepieces to choose from and you are bound to find one suiting your needs. Do you have questions? Then please contact our customer service department. We are the experts and always willing to offer a helping hand!